Jason Mercier and Ian Johns may be grabbing headlines, but Benny Glaser's having a huge summer too. Halfway through the 2016 World Series of Poker, there's a player putting up an impressive list of results, running deep in seemingly everything he plays, and threatening a truly dominant summer. Jason Mercier, who has two bracelets, a runner-up finish, and recently busted in eighth place from the $10,000 Omaha Hi-Low Championship final table? Of course, but this is someone else. Ian Johns, one of the best limit poker players out there, who has shipped two bracelets himself? Well, him too, but this is another guy. Benny Glaser was sitting with Mercier at that same Omaha final table, seeking his second bracelet of the summer. He already won the $1,500 event in this same game, taking down $244,103 for beating a field of 934 just days ago. "I'm good at all the games, but I'm a mixed specialist," said Glaser, who ranked Omaha hi-low as one of this three best games along with 2-7 triple draw and limit hold'em. "I think my edge is bigger in the limit games than no-limit, where everyone else is also good most of the time, comparatively." The 27-year-old pro from Southampton, U.K., also has a fifth-place finish in the $10,000 2-7 Single Draw Championship for $62,810 and a 12th in the $1,500 2-7 Single Draw for $4,562. That run puts him 11th in the current GPI WSOP Player of the Year standings, but he hasn't generated near as much buzz as Johns and Mercier, with the latter being the talk of the poker world. 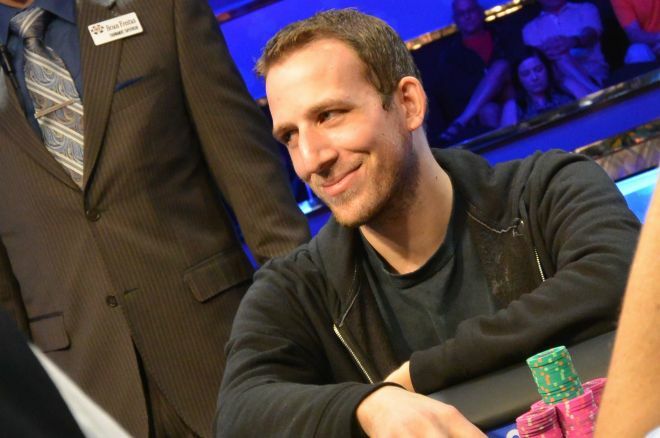 Yet Glaser, who found himself in the middle of the pack shortly after the dinner break, will be squarely in contention for one of the most prestigious awards in poker if he ships this for his second bracelet of the summer. That would be his third bracelet overall, so it isn't like Glaser is coming totally out of nowhere. In 2015 he did though, capturing his first bracelet in Event #33: $1,500 2-7 Triple Draw. It was a $136,215 score for a player who had less than $20,000 in live cashes coming in. And it followed a summer of 2014 in which Glaser bricked everything he played, walking away with zero cashes. That didn't dissuade him from a return in 2015 that turned out to be successful, because taking shots during the WSOP is standard for Glaser, who called the Series "special" and worthy of some aggressive attempts for a player used to playing stakes a bit smaller at online 8-game tables. So, what changed leading up to 2015 that's seen Benny Glaser rise as a consistent contender in a variety of games at the WSOP? Ask the man himself, and it's simply the inevitable tides of variance turning in his favor. "I don't even think I played much worse," Glaser said of his first shot in 2014. "Mostly, it's just I ran better [in 2015] than I did before. Obviously, I've improved a bit, but I'm running better and things are going better." One man who certainly didn't see this coming is PokerNews Editor-in-Chief Donnie Peters, who called Glaser the worst pick of Team Danzer, which spent $30 on the young Brit. Glaser chuckled as he admitted he saw that. "I knew I had a full schedule for the Series and I knew I'm a good player," he said. "So, I was like, 'OK, it will be fun to try to prove him wrong I guess.'" So far, so good, for Glaser, though he has a tough task ahead of him with this Omaha final table that featured Mercier with others such as Matt Glantz and Todd Brunson still left to battle with. Whether he finishes the deal or not, this has already been an incredible run for a player who, while certainly confident, may not have quite seen this level of success coming. "I've already outperformed expectations and run above what I was expecting," he said. "Obviously [if I win], it's pretty much a dream summer."